KIM CEYSENS is a Belgian dancer, actress and choreographer living in Brussels. As a child, her first movement experience is artistic gymnastics. Later on, she studies theater at the RITCS Brussels, obtaining her B.A. in 2009. From 2010 on, she studies contemporary dance at various European professional dance centers, among these at the SEAD—Salzburg Experimental Academy of Dance. She then works as a dancer for Philippe Saire, Benjamin Vandewalle, Albert Quesada, Shai Faran, Martin Kilvady, Francesco Scavetta and Michèle Murray. Kim Ceysens also works as an actress for films and was awarded two interpretation prizes for her role in the short film “Gabrielle” by Margot Fruitier and Paul Cartron. Kim Ceysens also teaches in various dance centers worldwide: The Danish National School of Performing Arts, La Manufacture in Lausanne, Beijing Normal University and Minzu University, Beijing, Danscentrum Jette in Brussels, Dock 11 Berlin, Dansatelier Reykjavik, La Raffinerie in Brussels, Fontys ACAPA and DOCH Stockholm. She choreographs for musical clips and works regularly with Brice Vdh and Simon Vanrie. She choreographs her first personal work in 2017–2018 with Swedish dancer Erik Eriksson. 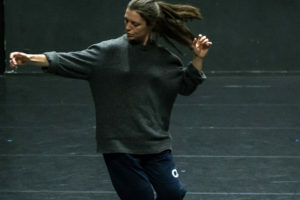 She has been a dancer for PLAY / Michèle Murray since 2017 in the ATLAS / STUDIES project.